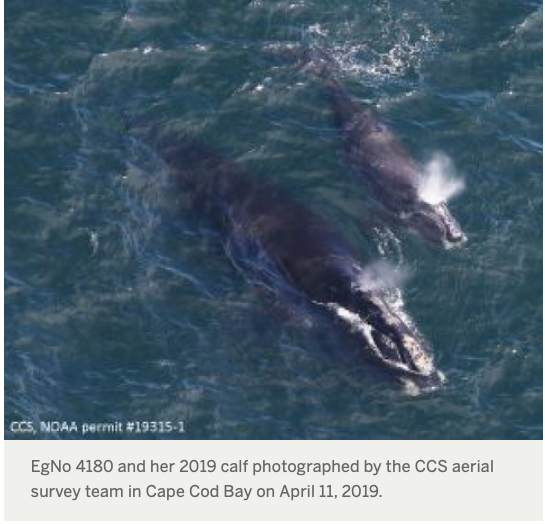 Right whales, so the story goes, got their name because they were the “right” whales to kill when whaling ships were active, due to the large quantities of oil and baleen they could provide. The killing was successful. 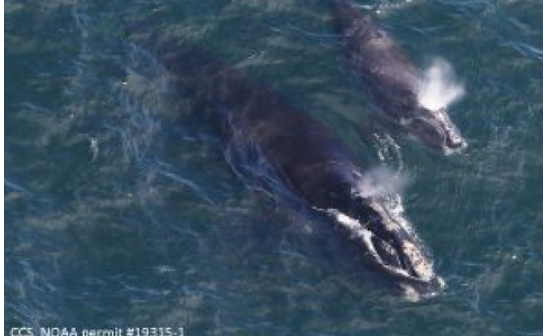 Right whales are among the rarest species of whales; there are only 411 of them in the world. Adult right whales are huge, growing to about 50 feet or so; the largest ever recorded was 65 feet long and weighed 89 tons. They’re generally larger than a school bus. The whales are migratory. They give birth off Georgia and Florida in the winter and swim to feeding grounds off New England in the spring. Right whales generally avoid open water and stay closer to shore where they can find shelter and their preferred food: zooplankton, krill and pteropods. They’re not picky eaters; they usually swim with their mouths open.